Lee "Faker" Sang Hyeok is a Korean League of Legends player. He is known for his hyper-aggressive play-style in the mid lane, and is considered by many to be the best League of Legends player of all time. He plays Ahri, Fizz, LeBlanc, Orianna and Zed. In February 2013, SK Telecom revealed a League of Legends team composed of Impact, bengi, Piglet and PoohManDu, with Faker in the mid lane. The team was called "SK Telecom T1 #2" to differentiate it from their long-standing StarCraft: Brood War team. They qualified for their first OnGameNet tournament where they were considered the underdogs against powerhouse teams such as CJ Entus Blaze and Najin Sword. The team beat them in a surprising fashion and took first place in their group, eventually placing 3rd in the tournament. 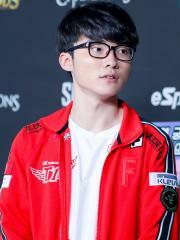 Faker quickly made a name for himself in the tournament during a game against MVP Blue. Playing as Leblanc, he went 10-0-1 by the 18-minute mark and forced them to surrender at twenty minutes in. Faker's team was renamed to just "SK Telecom T1" after the primary team, SK Telecom T1 #1, disbanded. Moving forward into the HOT6iX OnGameNet Champions Summer 2013, Faker continued his dominating performance and contributed greatly to the reverse sweep of KT Rolster Bullets in the grand finals, winning the tournament. This victory seeded them into the Season 3 Korea Regional Finals where they once again faced KT Rolster Bullets in the grand finals, winning once again and qualifying for the Season 3 World Championship. As the favorites to win the whole tournament, Faker and SK Telecom T1 stomped the competition with a 15-3 record, swiftly beating Royal Club 3-0 in the grand finals to win the $1m cash prize. On November 12, 2013, SK Telecom T1 picked up a new League of Legends roster, thus Faker's team was renamed to "SK Telecom T1 K". Season 4 began with a flawless victory by SK Telecom T1 K at the PANDORA.TV Champions Winter tournament, going 6-0 in the group stage, and 9-0 in the playoffs. After just a year of competition, Faker proved to the world that he is the greatest League of Legends player of all time. But due to a health concerns of PoohManDu and the resulting roster change, they had a less than stellar performance at the HOT6iX OnGameNet Champions Spring tournament. PoohManDu was able to rejoin the team to win All-Star Paris 2014, but their results dropped off for the rest of the season: a 5th-8th place finish at HOT6iX OnGameNet Champions Summer, losing the tie breaker for the second Korean seed to World, losing to Najin White Shield in the grand finals of the Season 4 Korea Regional Finals, and ultimately failing to qualify for the Season 4 World Championship. Due to changes in the OnGameNet League of Legends rules, the two SK Telecom T1 teams were forced to merge in November 2014. Faker stayed on the team, though shared the starting mid lane role with Easyhoon during the SBENU OnGameNet Champions. This led to fans being disappointed because they wanted to see Faker play in every game. They finished the season in 2nd place and ultimately beat GE Tigers in the grand finals to win the tournament, but Faker did not play a single game in the grand finals match. At present, Faker is ranked #56 in highest overall earnings, and #1 in highest earnings for players from Korea, Republic of. Before his 18th birthday, Faker was awarded $255,575.35 in cash prizes from 9 tournaments. 21.41% of his total prize money was earned before May 7, 2014. Out of the 45 tournaments awarding cash prizes that Faker had competed in, the largest amount was $338,000.00 from LoL 2016 World Championship on October 29, 2016. His 1st place finish makes up 28.31% of his total prize money won. On October 4, 2013, Faker arrived at the $100,000 milestone, winning $200,000.00 and placing 1st at LoL Season 3 World Championship. Prize money from 6 tournaments got him to that point. Faker has been awarded $17,926.00 in cash prizes from a single tournament within the last 90 days, all of which came in the last month.